(wm) For the fifth time in succession the well-known CG-Awards of the German auction house Christoph Gärtner were handed over to the winners during the opening day of the MonacoPhil event. It concerned ten prizes that were awarded to study groups and associations from all over the world, for publications of these clubs, like magazines and books. This time, there were two special prizes: one for ‘Digital Literature’ and one for ‘Youth’. The exhibits were assessed by a number of well-known jurors, such as Richard Johnson (South Africa), Patrick Maselis (Belgium) and Rainer von Scharpen (Germany). Each juror entered his votes in a computer, which then calculated the respective final score. The winner of the main group was once again the Collectors Club of Chicago (USA) that received a prize € 2,000 for its publication "U.S. Contract Mail Routes by Railroad (1832-1875).” The second place was for the German thematic club ‘Motivgruppe Musik’. The study group ‘ArGe Krone/Adler’, also from Germany, captured the third place. The special prize for digitally produced literature went to "PHILA HISTORICA", a free digital periodical about philatelic history and philatelic literature, edited by Wolfgang Maassen. The magazine can be downloaded free of charge on the Internet (www.philahistorica.de). The decision was very close: the Italian publication ‘Vaccari News’ was only half a point behind the winner. In the category ‘Youth’ the prize went to the German stamp collectors association ‘Meininger Briefmarkensammlerverein‘. PARIS — There is a rundown shop in my neighborhood near the Rue des Martyrs that never seems to close. When I peer through the window late at night, I usually see a small group of older men bent over a long table, picking up and moving around thousands of tiny bits of colored paper with their tiny tweezers. At first, I wondered whether the place might be a front for a bookie joint or a money-laundering operation. Not at all. It is very respectable. It goes by the name Action Philatélie — Action Philately — and has been in business for as long as anyone can remember. It is dedicated to the buying, selling, researching, sorting, evaluating and classifying of postage stamps. Boxes of stamps line shelves along the shop’s back wall. Loose stamps sit in envelopes and plastic bags. A desk is piled high with dozens of albums of stamps that once belonged to collectors who either lost interest or died. 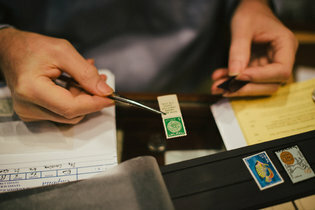 A long, narrow table covered in green baize that serves as the shop’s work space is arrayed with several thousand loose stamps, waiting to be sorted. Mr. Stern knows where to find any stamp you want. I asked if he had any stamps showing the Seine River. He whipped out a few folders and produced three large-format, engraved images from the 1940s. He pushed toward me a 100-franc French stamp in a color called red carmine. It showed the Belle Époque Alexandre III bridge over the Seine, the Grand Palais museum in the background. “Two euros!” he said. “Sold!” I replied. I could see how this stamp thing could become addictive, particularly in a place like Paris. Paris is still a city of stamp lovers. An estimated two million people in France have private postage stamp collections, according to the French Association of Dealers and Experts in Philately. For four days in November, Paris will host its 71st annual Philatelic Salon that will bring vendors and collectors together from France and around the world. The neighborhood where I live in the Right Bank’s Ninth Arrondissement is the city’s stamp district. About 30 stamp shops line the Rue Drouot near the Hôtel Drouot, one of the world’s oldest auction houses. The French Association of Dealers and Experts in Philately, a private association with 180 members, has its headquarters here. Several more stamp shops are in the Passage des Panoramas, one of Paris’s turn-of-the-19th-century covered arcades, in the Second Arrondissement. 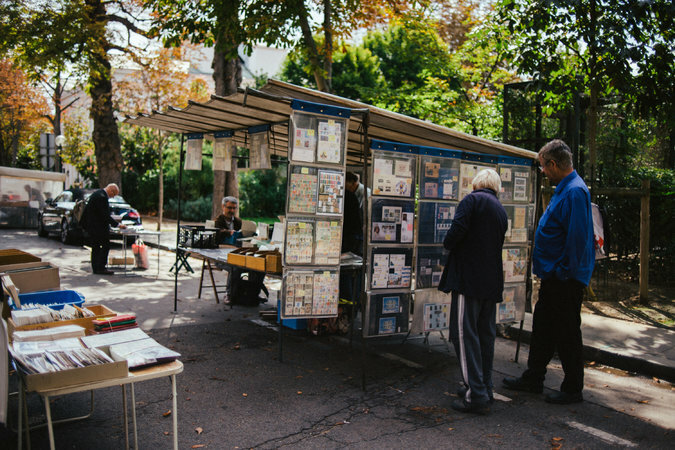 Then there is the open-air stamp market at the Carré Marigny in the Eighth Arrondissement off the Avenue Gabriel. Since the 1860s, when a rich stamp collector gave the space to the city of Paris for the express purpose of buying and selling stamps, merchants have done just that. Cary Grant and Audrey Hepburn made the stamp market famous for American audiences in Stanley Donen’s 1963 romantic thriller, “Charade.” It has to be the best postage stamp movie ever made. Back then, the market was a beehive of activity, with dozens of dealers and wall-to-wall stamp enthusiasts. These days, only a dozen or so merchants continue to set up their small portable stalls for the thrice-weekly market, selling postcards and old letters as well as stamps. 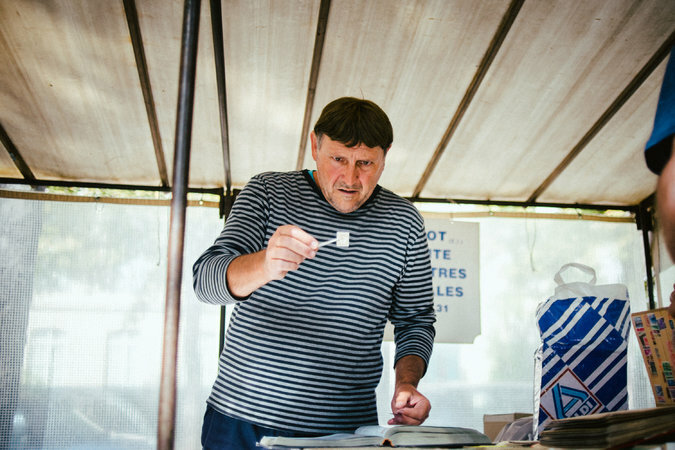 For Michèle Peiny, a retired accountant who opened her stall 12 years ago, the stamp market is less a way to make money than to see friends. “I open when the weather is nice, and when I know my friends will be here,” she said. The internet has cut into the business of retail stamp merchants, but not destroyed it. “You can see something very beautiful on your computer screen, but you can’t turn it over to see if there’s a defect on the other side,” said François Farcigny, president of the French Association. Shops up and down the Rue Drouot are open again after closing for vacation. Some businesses are family-run operations that go back four generations. Some sell stamp guides and histories; instruments for stamp analysis; antique stamp boxes; and, of course, stamps. Some offer free estimates. One shop put an enormous zippered clothing storage bag full of tens of thousands of stamps in the window. The price: 1,500 euros ($1,760). I asked Jean-Pierre Lallemand, the manager of Théodore Champion S.A.down the street, whether I should invest in it in the hopes of finding hidden treasure. You still can find stamps for sale in everyday places in Paris. The front windows of the newspaper shop on the street where I live display not only magazines, best-selling books and small toys, but also cellophane-wrapped packages of assorted stamps for about $8 apiece. I learned why one morning when I found Jean-Marc Lépine, the owner, bent over a large album on the counter, oblivious to my presence. “What in the world are you doing?” I asked. “I’m sorting,” he said. “I’m finding so many wonderful stamps.” He said it as if it were the most natural thing for a newspaper seller to be doing. It turns out that Lépine has been collecting stamps since he was a boy and has a room full of them at home. He had recently bought a giant “lot” of loose stamps, which he keeps in plastic boxes behind the counter. When business is slow, he sorts and files them into albums according to origin and subject. Elaine Sciolino’s most recent book is “The Only Street in Paris: Life on the Rue des Martyrs.” Bérengère Sim contributed reporting. The latest edition of The Philatelic Journalist, the official magazine of the International Association of Philatelic Authors and Journalists (AIJP), which is published three times a year, has been available since the beginning of this month. The issue is dominated by the upcoming international event MonacoPhil in Monte Carlo and by the extraordinary special exhibition about Philipp von Ferrari. It also provides interesting contributions that contain useful advice, a review of FINLANDIA 2017 and the complete regulations for the upcoming international philatelic literature exhibition ITALIA 2018, for which application closes at the end of this month. Another important contribution concerns the first part of a study on the development of organized philately and philatelic literature in Canada. As always, most contributions are written in English, but a number of the articles are also available in German. (wm) Many stamp collecting clubs offer far more than just the exchange of stamps or regular moments on which their members can meet. They maintain a regular professional program with exciting topics and with lectures given by well-known speakers. Take for instance the German association called “Verein für Briefmarkenkunde 1878 e.V.” in Frankfurt am Main. On 21 November 2017 Rainer von Scharpen will present lecture about the so-called perfins (perforated initials). There have been times that collectors regarded stamp with such tiny holes as worthless. How different things are today! The place where Rainer von Scharpen will adress the members of the aforementioned stamp association and everyone else who is interested in the subject will be the PHILA library Heinrich Köhler, Langer Weg 16-18, 60489 Frankfurt am Main in Germany. Originally, the lecture was planned for the 7th of November, but due to technical reasons it will take place two weeks later, on 21 November 2017. Contact: H. Krug, Telephone 069/78800983. Guests are always welcome! (mm) The Hans Wagner Medal is the second-oldest philatelic award in Germany. It was installed on 22 April by the German ‘Verein für Briefmarkenkunde 1885 e.V. Mainz’. The aim was to honour the merits of Hans Wagner (‘father’ of the German ‘Deutsche Philatelistentage’ and promotor of the unification of philatelic associations under a common umbrella). Since 1910, club leaders and researchers have been awarded this medal for outstanding philatelic activity. It is awarded only about every five years. It is considered by many to be the most representative award in the philatelic field. Lothar Both, the chairman of the Mainz association, recently honoured Wolfgang Maassen from Schwalmtal. Maassen was also awarded for his previous work. Wolfgang Maassen (born in 1949) worked for the official German league of philatelist (BDPh) for nearly 40 years. 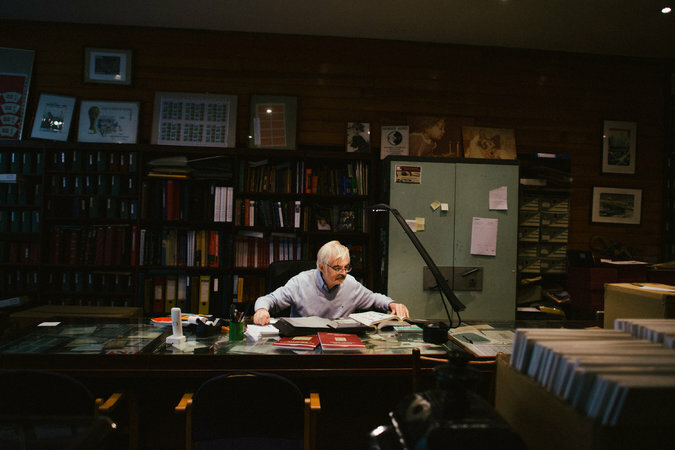 He acted 28 years as the Editor of the German stamp magazine “philatelie”. He was active as press officer, team manager and/or organiser during three important exhibitions: IBRA 99 in Nürnberg, IBRA/NAPOSTA 2009 in Essen and IPHLA 2012 in Mainz. He is the only German philatelist who was jointly responsible for three international exhibitions on German soil. Numerous are his publications, which include more than 80 book publications and over four thousand articles. The number of the awards that he gathered from all over the world can hardly be overlooked. The list of winners of the Hans Wagner Medal during the last 25 years is short. The list includes only five names of prominent philatelists: Peter Fischer, Berlin (1992), August Wahn, Heilbronn (1995), Consul Hermann Walter Sieger, Lorch/Württemberg. (1999), Reiner Wyszomirski, Langen (2004) and Eckart Bergmann, Arnstad (2011). Legendary names are also found among the other receivers of the medal. For example, Victor Suppantschitsch (1918), Hugo Krötzsch (1920), Arthur Ernst Glasewald (1925), Ludwig Hesshaimer (1928), Erich Stenger (1931) and Franz Kalckhoff (1947). Maassen has written extensive philatelic essays about some of the aforementioned persons. Cult Foxes Decorate Stamp Fair Cover!